After pounding the pavement last week and working with Fitbit ambassador Greg Whyte to understand how heart rate zones can help me to run better, faster and more injury-free, this week I'm slowing down the pace and exploring the stress-reducing fitness benefits of yoga. 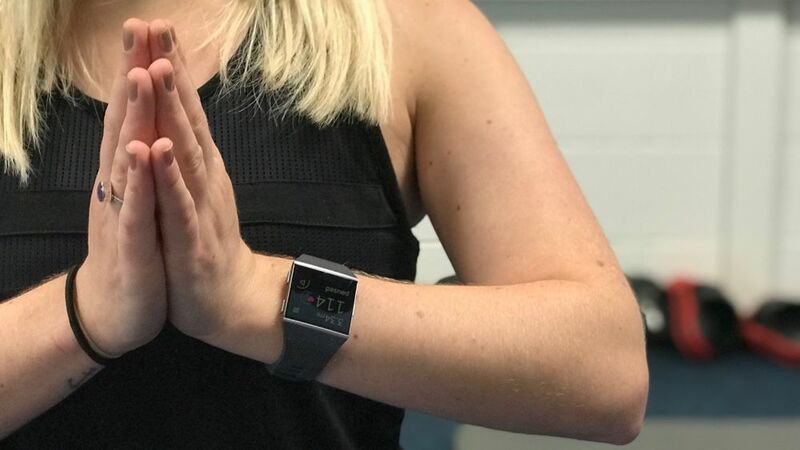 I'm Becca Caddy, and I'm on a mission to use the heart rate features of the Fitbit Ionic to get fitter, faster – and I'm trying out a host of new workouts and fitness classes in the process. Like running, I've fallen in and out of love with yoga over the past ten years, trying everything from Kundalini yoga in London to Hatha yoga in Thailand. But, also like running, I've lost my drive and my consistency. So with that in mind, I was interested in chatting to Fitbit ambassador and former Olympian Greg Whyte about the role of yoga in training and whether it's really worthwhile. "The great thing about yoga is it's working on flexibility, mobility, agility and also things like core strength stability," said Greg. "All of these things have an important role to play in improving your overall fitness, so yes, yoga is a great option." But Greg said that although using yoga is good for building up a big picture when it comes to fitness, there are plenty of psychological benefits too. "More than anything for me, the benefits of yoga are psychological. There are so many emotional and mental health aspects of yoga. It sits in the mindfulness space and is a great opportunity to turn off the noise of life," said Greg. "That means it's interesting for heart rate too." On Greg's advice, I took this as a great opportunity to test out the tracking in the Fitbit Ionic and learn more about how breathing, stress and mindfulness can affect my heart rate, sleep and performance. When using the Fitbit Ionic, you can have seven exercises selected at any one time that are easily accessible from the screen. As a default, they're running, cycling, swimming, treadmill running, weights, workout and interval workout. But you can add additional activities, like spinning, golf, circuit training, kickboxing and, you guessed it, yoga. You don't get the same level of tracking as you do with swimming, cycling and running, but you can measure the duration of your session, your heart rate and the distance covered – although that won't be much further than my yoga mat. Once I'd set up yoga as an option in the Fitbit Ionic, I also customised the watch face to show solely heart rate and time elapsed. I didn't want to get distracted during the yoga session and it's great that I can have lots of metrics on display while running, then strip them all back for yoga within seconds. So for this week's challenge, I joined a yoga class with my Fitbit Ionic strapped on. The class is run by a friend of mine, and incorporates mainly Vinyasa Flow style yoga, which is a class that's based on free-flowing movements, which then progresses within minutes to tricky poses that require a lot of strength and focus. Unlike running, I wasn't sure what to expect from my heart rate data. For me yoga is a mixture of calming and challenging – but Greg explained in more detail. "During yoga itself you'll likely see a steady elevation of heart rate – because you're working out," Greg told me before the session. "But there should be an element of relaxation about it too. So the global benefits of yoga – it will improve physical performance, definitely. But it should be improving emotional and psychological well-being too." We spent the first half of the session flowing through sun salutations and holding a number of the more challenging poses, like Chaturanga Dandasana (a difficult plank position). Then we spend some time really leaning into shoulder and arm stretches with the aim to loosen up and build up strength so the Chaturanga becomes a little easier and less painful and shaky. The heart rate data from the Ionic was really interesting. As you'd expect, it didn't hit the highs of running, but Greg was right in that my heart rate did fluctuate quite quickly, presumably as I moved between poses. Although burning fat isn't one of my primary goals throughout the challenge, it was really interesting to see I spent a lot of time in Fitbit's fat burn zone throughout the lesson. This just goes to show that the fitness myth that you need to work really, really hard to lose weight is rarely the case. At the end of the yoga session, there was a few minutes of meditation time. As you can see from the chart above, my heart rate slowed down a little towards the end and then elevated again a little as we came back to a sitting pose. The effect the meditative time had on my heart rate chart got me thinking a lot about heart rate and its relation to stress. I asked Greg to explain the science behind stress to me in a little more depth. "Your heart rate responds to a variety of circulating hormones. The ones we know as stress hormones, like cortisol, but also fight or flight hormones such as adrenaline." said Greg. "When we're stressed, both of those rise. So the heart rate is a nice indicator of global stress. This means you find people who are very stressed have a high heart rate because of circulating hormones. What this means is if you can reduce that stress, by relaxation, you'll reduce those stress hormones, the cortisol and adrenaline drop and so therefore heart rate will drop too." Greg said. This all sounded fascinating – I love learning more about the way my body works – but I asked Greg to explain what that really means from a practical point of view. "It simply means that heart rate is a lovely measure for stress. It responds very rapidly and acutely, so we can actually tell whether we're having a positive impact or not." Greg said. Although there's a really soothing meditation session at the end of my yoga class – I wanted to get those benefits at home. Well, the Fitbit Ionic comes with a breathing feature to enable me to slow my breath – plus mimic the relaxing elements of a yoga class and reduce my heart rate. To get it started I select the Relax option from my Ionic and it spends a minute or two sensing my breathing. It then shows a circle expanding and contracting and the idea is you sync your breathing up to the circle. At first this can feel challenging – especially if you're stressed – but over the course of a few minutes I quickly noticed I felt calmer and more in control. What's really interesting is the Ionic then displays what it's helped you do, which for me is often reducing my heart rate by a huge 5bpm in a matter of seconds. 5bpm doesn't sound like a lot, but it's a quantifiable reduction in my physiological response to stress, and something I'm able to achieve anywhere – not just at a yoga class. Using the Fitbit Ionic to track my yoga session was fascinating because I didn't know what to expect. It was great to see that poses affected my heart rate as I moved through them – and that the meditation session at the end really did the trick. That's probably why yoga is such a great way to work out, yet doesn't leave me feeling as pumped up and on edge as running sometimes does. For me that makes it really valuable because it gives me a workout and calms me down, helping to reduce my heart rate and become more focused and mindful in the process. When choosing the next activity to dive into, I asked Greg what he thinks I should try and which kind of exercise is "the best". "It's all about variety. Variety brings psychological benefits because it makes it more interesting," said Greg. He told me it's the psychological benefits that keep you motivated and, crucially, keep you moving and wanting to work out. So with that in mind, next week I'll be attending a high energy spinning class. I can't wait to see how my heart rate is affected, how high the highs can go and, crucially, whether I'll be able to reduce my heart rate and get a good night's sleep afterwards.